So rare to get a complete set! 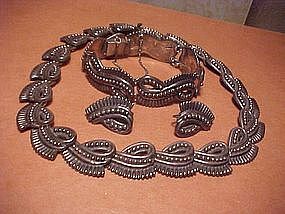 This is a Los Castillo necklace, bracelet and earrings set with a design of swirls, dots and ribs. The necklace measures 15 1/2" end to end and is 3/4" wide. The bracelet is 7" around in the inside and 3/4" wide and the screwback earrings are 1" long and 3/4" wide. All pieces are signed as shown. A wonderful parure.